Occupy Denver stands in solidarity with The Tar Sands Blockade, and is calling for national and international mobilization and solidarity actions against the construction of the Keystone XL Pipeline. Tar sands giant TransCanada has begun construction on the southern leg of the Keystone XL. Leading NASA Climate Scientist James Hansen has called the Keystone XL “game over” for the climate, and Americans are already feeling the heat. The pipeline will make TransCanada rich while encroaching on ranch lands, poisoning Texas’ working class communities, and destroying the environment that makes the lone star state so beautiful. Kick off the new year by demonstrating your resistance to Keystone XL! Join us for another mass action in Southeast Texas on Monday, January 7th, including a 3 day training camp leading up to the big event. Our trainings and events are open and include roles for everyone ready to defend our homes from toxic tar sands. RSVP right now so we can know how many people to expect. As a grassroots campaign, we are funded entirely by the generosity of individual donors. Meaning that every dollar of your contribution goes directly into stopping TransCanada and the Keystone XL tar sands pipeline where it matters most. The Tar Sands Blockade is one of the most important resistance actions in the nation. If you can’t join us, you can still help. Please consider donating. And please join our E-Action to help continue to spread awareness and support our people on the ground. On Wednesday, December 12th, members of (de)Occupy Honolulu filed a lawsuit against the City & County of Honolulu, Wesley Chun (Director & Chief Engineer of Department of Facilities Maintenance), Trish Morikawa (County Housing Coordinator), and Sergeant Larry Santos (Honolulu Police Department), over deprivation of civil rights during raids on the encampment, in the U.S. District Court for the District of Hawai`i. On Monday, December 17th, a Temporary Restraining Order has been issued, until the Preliminary Injunction hearing in a month, dealing with raids of Thomas Square. All defendants have either quit their jobs or retired since the last raid at Thomas Square, the day before Thanksgiving. 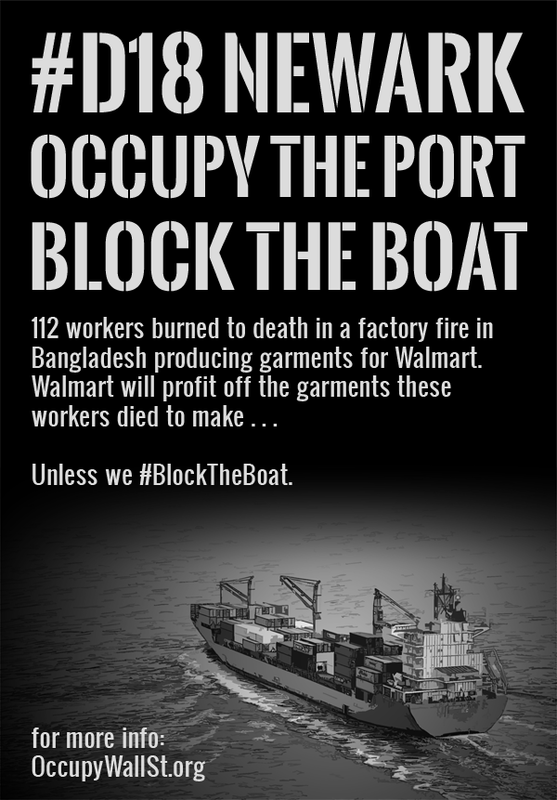 On November 25th, 112 workers burned to death in a factory fire in Bangladesh producing garments for Walmart. The Port of Newark is a major entryway for Walmart garments coming from Bangladesh. Walmart is going to profit off of the garments these workers died to make. Unless we block the boat. Walmart - the world's largest employer and 1% corporation - refuses to take responsibility, compensate the families, or take any action to prevent needless deaths like this from happening again. The 1% must not profit from the workers' deaths in Bangladesh! On Tuesday December 18th, buses will be leaving at 6am from Canal and Broadway in Manhattan to head to the port. If you’re not taking the bus, the staging ground location will be the IKEA parking lot in Elizabeth, NJ at 7am. Timing is critical. We're calling on Occupiers near all East Coast ports to be on alert if the cargo ship is re-routed to dock at another port. Open house & holiday festival hosted by Strike Debt NYC and featuring special guests Silvia Federici, George Caffentzis, David Graeber, and more! We will have report-backs, speak-outs, collective visioning, food, drinks, art, music, radical children's area, and more!